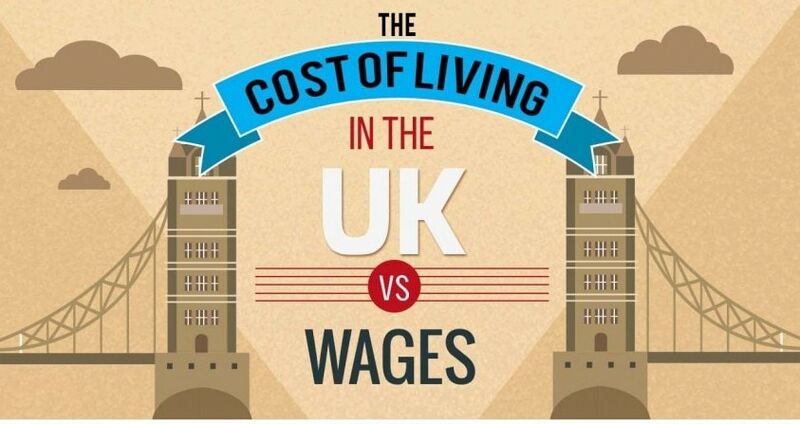 How Does the Cost of Living in the UK Compare to Wages? It’s a depressing fact that a large portion of your salary will go towards basic living costs, predominantly the cost of your accommodation. And though there are far more glamorous things that I’m sure we would all rather spend our money on, putting a roof over our head comes in as the top priority, so it’s important that we find a job that can support us financially. However, with house prices going up in the UK and the cost of renting on the increase too, this is becoming a tougher and tougher matter to face. Swift Money have put together this infographic looking at the current house prices in the UK, alongside the average wages for British workers. They compared these to prices in 1999 to see how things have changed over the years. What are the average house prices in the UK? The average house price in England was £284,538 in 2015 compared to £74,096 in 1999. House prices have gone up by 284% since 1999. The cheapest part of England to buy a property is the North East. How much does it cost to rent in the UK? In 2014 the average cost to rent a 2 bed property in England was £677. The most expensive region to rent in is unsurprisingly London. You’ll have to fork out a huge £1375 a month for a 2 bedroom property in the Capital. The cheapest region to rent in is the North East costing an average of just £456 for a 2 bedroom property. What are the average wages? The average wage in 1999 was £20,800. It has now gone up 27% to £26,394. The highest average wage is in London, with workers earning an average of £34,200. The lowest average wage is in the North East, where workers earn an average of £24,450.